Make Short notes: Short notes creation is a good way to remember what you learn. Start writing topic in short points and diagram which will give maximum information in minimum words. By writing everything in short or diagrammatic form you will able to remember everything that you study. It is a great way of remembering. Understand what you learn: When you study for something then put focus on understanding concept. Because once you perfectly understand all concepts then you will never forget it. Without understanding you will never remember anything. Once you understand everything then it will easy to remember. This technique is most important for remembering. If you want to get good remembering ability then try to understand the concepts in the topic. Give recap and recall: Give a quick recap to study by remembering after a specific time span constantly. When you start remembering everything then you will understand what points you are missing and how to improve it. This is a good type of study. Recall of study will improves learning habit and will help to remember everything. Divide the topic into different parts: Apart from learning whole topic, divide it into different parts that are modules so you will understand it in easy way. This technique for remembering what you learn will speed up your learning, understanding and remembering ability. 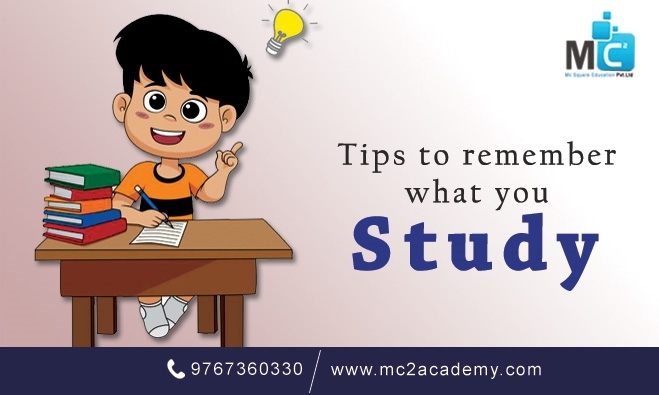 Given methods and techniques for remembering will speed up the process of study and will help you in understanding the concepts. Once you understand the concepts then it will be easy to remember. So if you are not good in remembering then capture these methods. Once you remember everything then you can able to achieve good marks in the NEET Exam.